Interstate 82 is a northwest to southeast freeway that links Interstates 84 and 90 in Oregon and Washington. The highway originates in the Kittitas Valley near Ellensburg, where it travels south and crosses Manastash and Umtanum Ridges along the west side of Yakima Firing Range. Winding from Selah Valley directly along side the Yakima River, I-82 & U.S. 97 travels through a gap west of Yakima Ridge into the city of Yakima. 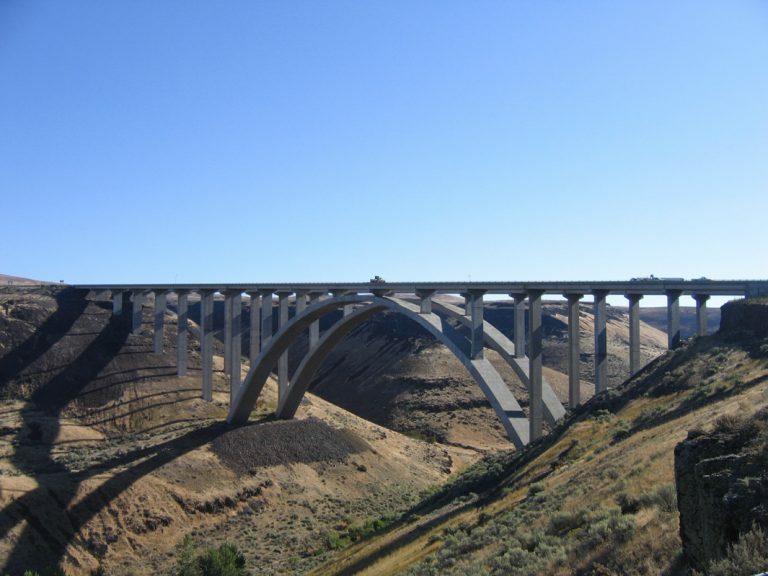 The concrete arch Fred G. Redmon Bridge (dedicated in November 1971) carries Interstate 82 and U.S. 97 over Selah Creek in a rural area north of Yakima. The top of the arch measures approximately 325 feet above the canyon floor and has a length of 1,336 feet. Each arch span measures 549 feet in length. When they were built, these two concrete arches were the largest of their type in the United States. Photo taken 08/31/06. Yakima used to include a Business Loop for I-82 through Downtown, while I-82 combines with U.S. 12 and 97 through eastern reaches of the city adjacent to the river. South of Union Gap, U.S. 97 parts ways with the corridor for Wapato and Toppenish while I-82 & U.S. 12 veer southeast along the Yakima River toward Snipes Mountain and Sunnyside. Interstate 82 & U.S. 12 remain paired through eastern reaches of Yakima Valley to Grandview and Prosser before ascending along the northern slopes of Horse Heaven Hills east to Benton City and the Tri-Cities area. U.S. 12 separates with I-82 for Interstate 182, the a freeway spur leading east through Goose Gap to Richland and Pasco. Staying south of Badger Mountain along the periphery of Horse Heaven Hills, Interstate 82 bypasses Kennewick to a merge with U.S. 395. The pair depart the Tri-Cities for a southerly route over Horse Heaven Hills along side Bofer and Fourmile Canyons. Once at Plymouth, the pair meet the east end of Washington 14 and the Columbia River. Spanning the Columbia along I-82 & U.S. 395 is the Umatilla Bridge. The bridge consists of separate spans, the eastbound crossing opened in 1955 and the westbound completed in 1987. U.S. 395 breaks away from the freeway at Umatilla just south of the state line to combine with U.S. 730 nearby. Interstate 82 stays to the west through agricultural areas and Herimiston to end at Interstate 84 adjacent to the Umatilla Army Depot. Interstate 82 follows U.S. 97 from Interstate 90 south to Yakima, U.S. 12 from Yakima east to the Tri-Cities, and a new alignment from there southeast to the Columbia River and Interstate 84. Although U.S. 395 is currently signed on this section of Interstate 82, U.S. 395 used to follow a different route. 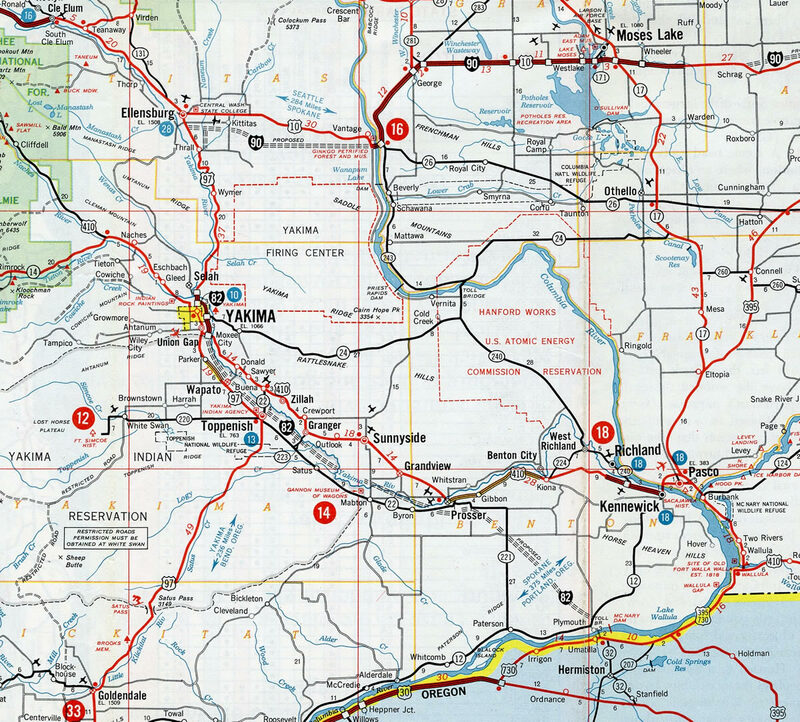 Before Interstate 82 was completed between Umatilla and Kennewick, U.S. 395 went between Umatilla and Pasco through Wallula and Burbank, overlapped with U.S. 730 and U.S. 12. Once the freeway was completed, U.S. 395 was rerouted to follow I-82. 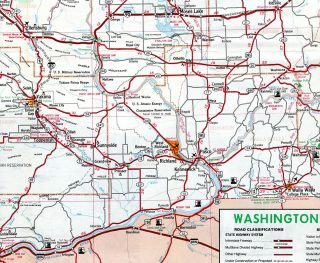 Southern Washington – 1968 Washington Official Highway Map. The routing of Interstate 82 (known as McNary Highway Number 70 in Oregon) was mired in controversy. I-82 was an original route included in the Interstate Highway System by the federal Secretary of Commerce in 1956, based on a Department of Defense recommendation. The states impacted by this route, Washington and Oregon, however did not agree on the route of Interstate 82. Its course would remain unsettled and undergo several corridor studies. Washington and Oregon disagreed on which cities would be served by this proposed route and which ones would not. 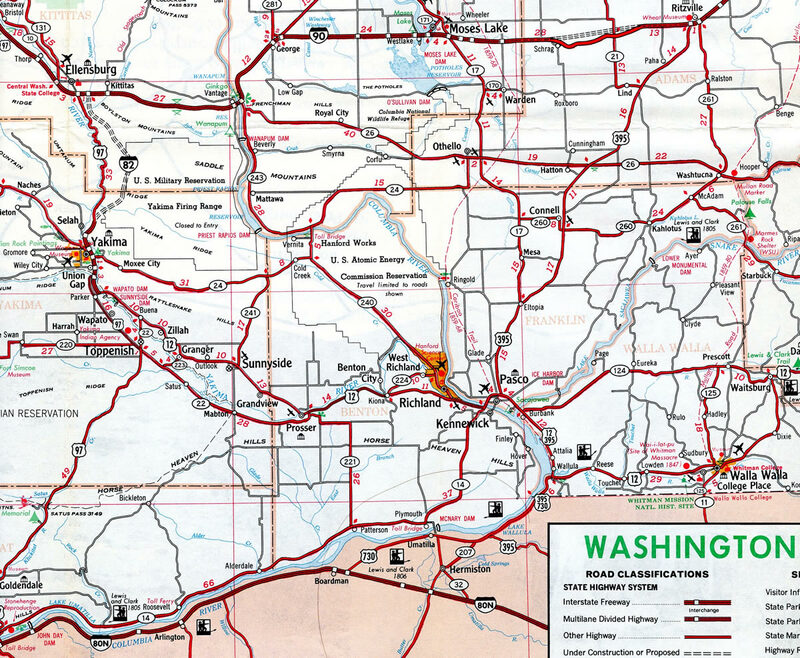 The two major corridors considered for Interstate 82 were (1) the Umatilla route, beginning at Interstate 84 in Stanfield, Oregon and traveling northwest through Umatilla toward Prosser, Washington or (2) from Interstate 84 at Pendleton, then northwest to Wallula and then northwest to Prosser in Washington. Alternative #1 was agreed upon by the two states, but it was protested by groups from the Tri-Cities concerned about an economic disadvantage by not being located on the Interstate. While Alternative #2 would have been longer, it would have allowed Interstate 82 to connect more directly with the Tri-Cities (Richland, Pasco, and Kennewick) and Walla Walla. These routes were debated for the ensuing decade, and compromise was finally reached in 1973. According to a Washington Highways article from the 1960s, Interstate 82 was at one time planned to be routed over the Naches Pass rather than due north to Interstate 90 at Ellensburg (thanks to Mark Bozanich for researching this proposal). This was never a definite routing; it was simply a “possible” routing. Naches Pass lies along the Naches River between Washington 410 at Greenwater and Washington 410 near Cliffdell. Routing Interstate 82 through this pass would alleviate traffic on Interstate 90 over Snoqualmie Pass and provide easy access between Tacoma and Yakima. The highway department proposed building a highway of some type over Naches Pass for several decades. One plan would include building a 9000 foot long tunnel under the summit. This corridor is officially designated under state law as Washington 168. Washington 168 would connect with existing Washington 410 near Greenwater west of Naches Pass and near Cliffdell to the east. Naches Pass is in a more direct line between Tacoma and Yakima than Chinook Pass, the pass presently crossed by Washington 410 (formerly U.S. 410). Washington 410 cuts through the northeast corner of Mt. Rainier National Park. Commercial traffic is prohibited in the park. Also, Chinook Pass is closed in winter due to heavy snow accumulation. A new highway over, or under, Naches Pass would provide a direct Tacoma-Yakima connection, be open year round, and be open to cars and trucks. Such a route would link the agricultural Yakima Valley with shipping facilities at the Port of Tacoma. The highway department has no active plans to build the Naches Pass highway but state legislators from the Yakima Valley bring up the issue from time to time. Even if such a route is built, it may be a two-lane expressway for several years before being upgraded to four-lane divided freeway. Madras route: From Umatilla through Heppner, Condon, Fossil and Antelope to Madras, where the interstate would replace Highway 97 south through Bend to the California border. Prineville route: From Umatilla through Heppner, Hardman, Spray, Prineville, Powell Butte to Highway 97 near Bend, then continue south to the border. Highway 395 route: From Umatilla through John Day, Burns and Lakeview. Posted after Exit 5 (Power Line Road), this is the final shield for Interstate 82 eastbound. The freeway angles southwest across agricultural areas on the ensuing stretch west of Hermiston. Photo taken by Daniel Tedford (06/18/06). Running along the east side of Umatilla Army Depot, eastbound Interstate 82 reaches the penultimate exit at Westland Road. Interstate 84 follows in one mile. Photo taken 08/31/06. Curving southwest from Wheatland Road, Interstate 82 advances 0.6 miles to the directional T interchange with I-84 & U.S. 30. The forthcoming ramp for westbound leads travelers to The Dalles, Hood River and Portland. Photo taken 08/31/06. The I-82 eastbound mainline defaults onto Interstate 84 & U.S. 30 east to Pendleton, La Grande, Baker City, Ontario, Caldwell, and Boise, Idaho. Photo taken 08/31/06. Two miles ahead of Interstate 82 west to Umatilla, McNary Dam on the Columbia River, U.S. 730 west to Irrigon and Kennewick of the Tri-Cities. Photo taken 08/28/06. Westbound I-84 & U.S. 30 meets Interstate 82 three quarters of a mile beyond Exit 180 to Westland Road. I-82 represents one of six crossings of the Columbia River between Hermiston and Portland. The succeeding bridges are located at Biggs (U.S. 97) and The Dalles (U.S. 197). Photo taken 08/28/06. A third westbound lane joins I-84 & U.S. 30 between Westland Road and the northbound beginning of Interstate 82 (Exit 179) to the Tri-Cities of Washington (Richland, Pasco, and Kennewick), and Yakima. Photo taken 08/28/06. Interstate 82 initially travels north to the city of Umatilla, where it merges with U.S. 395 to cross the Columbia River. Once it enters Washington, the freeway arcs eastward across the Horse Heaven Hills to Kennewick, where U.S. 395 branches northeast to Pasco and Spokane. Photo taken 08/28/06. The two-mile advance sign on I-84 & U.S. 30 east for Interstate 82 precedes Exit 177 to the Umatilla Army Depot. Photo taken 08/28/06. Interstate 82 stems north from I-84 & U.S. 30 east in one mile. The freeway passes between Umatilla Army Depot and the city of Hermiston to the east end of U.S. 730 at Umatilla. Photo taken 08/28/06. A flyover ramp (Exit 179) shuttles travelers onto Interstate 82 west from I-84 & U.S. 30 east. I-82 forms part of the fastest route from Portland to Spokane, Washington via connections with U.S. 395 north from the Tri-Cities to I-90 east at Ritzville. Photo taken 08/28/06. Continuing north from the Westland Road on-ramp, motorists pass by the first confirming marker for I-82 west. The stretch west of Hermiston is one of the few along I-82 not paired with a U.S. highway. Photo taken 08/28/06. The final reassurance shield assembly for Interstate 82 appears after the interchange (Exit 1) with Washington 821 Photo taken 08/28/06. One mile out from Interstate 90 on I-82 west & U.S. 97 north near Ellensburg. I-90 travels west to Seattle via Snoqualmie Pass and east to Spokane via Moses Lake. Photo taken 08/28/06. Tjossem Road spans Interstate 82 just ahead of the ramp separation for I-90. The freeway defaults onto I-90 west along the west side of Ellensburg. U.S. 97 combines with the freeway west to Exit 106 for University Way. Photo taken 08/28/06. Interstate 90 travels along a remote stretch east from I-82 and Ellensburg to cross the Columbia River at Vantage. Westward beyond U.S. 97, Interstate 90 continues to Cle Elum and metropolitan Seattle. Photo taken 08/28/06. I-90 east & U.S. 97 south split one mile east of the loop ramp (Exit 109) for Canyon Road (former U.S. 97 / Business Loop I-90) at Interstate 82. Photo taken 08/31/06. An auxiliary lane opens east from the Canyon Road entrance ramp to Exit 110 with Interstate 82 east to Yakima. Photo taken 08/31/06. I-90 east enters the trumpet interchange (Exit 110) with Interstate 82 east and the departing U.S. 97 south . Photo taken by Jeff Royston (09/99). Interstate 90 west at I-82 east & U.S. 97 south to Yakima. This ramp shifts westward to merge on the right side of the on-ramp from I-90 east. Photo taken 09/01/06. Reassurance shields for Interstate 82 east & U.S. 97 south, posted just beyond the Tjossem Road overpass by I-90. The freeway travels 28 miles to Selah and 32 miles to Yakima. Photo taken 08/31/06. Andy Ransom, Personal Email (“AARoads feedback: I-82 historic routes”), Tuesday, May 16, 2006. “Eastern Oregon waits for new highway.” The Bulletin. “I-82 saga was 25-year freeway tug-of-war.” Tri City Herald, November 25, 1984. “113-Mile Road To Plymouth Given Routing.” Ellensburg Daily Record, May 22, 1963. Page updated June 10, 2015.